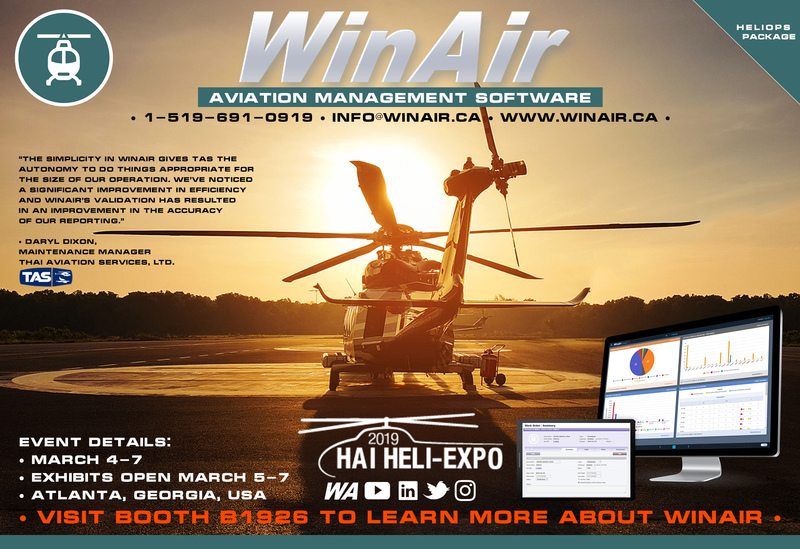 London, ON, Canada/Atlanta, Georgia, USA – January 30, 2019 – WinAir is thrilled to announce that the company will be attending the Helicopter Association International’s HAI Heli-Expo 2019 at the Georgia World Congress Center in Atlanta, Georgia, USA. 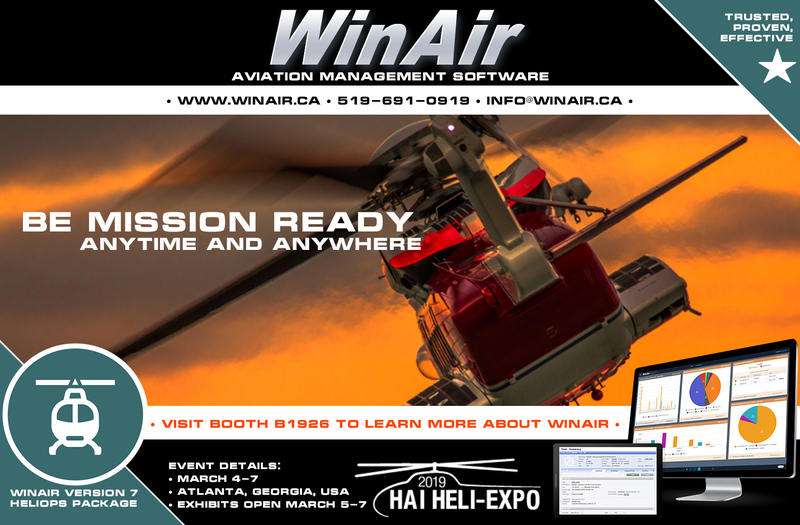 From March 4th to 7th, WinAir team members will be on hand at the exhibition to demonstrate the latest cutting-edge features and functionality enhancements in their WinAir Version 7 Heliops Package. They will also be available to explain how the software has proved to be instrumental in streamlining and expediting business processes for helicopter operators from around the globe.With the WinAir Version 7 Heliops Package, helicopter operators are benefitting from a common sense approach to helicopter maintenance management that follows actual aviation maintenance work steps, which makes it easy for members of staff to take charge of the solution and provide accurate and comprehensive information to the management team. This software package has been designed around the concept of establishing software controlled best practices for the hangar floor, so that helicopter operators can always remain mission ready. Plus, with WinAir’s Heliops Package, heliops can rest assured knowing that the software has been bundled with all of the essential items that they require to meet their unique business needs and remain compliant with industry standards and regulations. They will be able to complete tasks quickly and with ease, such as updating assembly changes, managing complex counters, overseeing dynamic components, and amending variable cycles. In addition, helicopter operators will also benefit from WinAir’s recently released Dashboards enhancement for WinAir Version 7. With this new enhancement, businesses operating in the helicopter sphere can reap the rewards of having instant access to highly visual and real-time representations of system data for at-a-glance awareness of current performance. Not only does this enhancement provide businesses with a new way for viewing system data, but it also plays a profound role in assisting key staff with making strategic and proactive decisions. When displayed on a monitor on a hangar floor, Dashboards will provide vital information to various team members with live system updates. Whether your helicopter operation is new to the industry or is firmly established, the WinAir Heliops Package will satisfy all of your operational needs. It is fully scalable, so it will grow with your operation as you expand your business. It can also be customized to meet the unique specifications of any operation or it can be taken as an all-inclusive package option. For those helicopter operations that are looking to boost the software implementation timeline, WinAir offers full turnkey solutions. Are you attending HAI Heli-Expo 2019? If so, we would love to meet with you at the show! Contact us today for more information on WinAir or to schedule your VIP meeting with the WinAir team at Booth B1926! Based in London, Ontario, Canada, WinAir has 30 years of experience as a leader in aviation management software. Companies rely on WinAir to efficiently and effectively track and manage aircraft maintenance and inventory control. WinAir is proud to lay claim to hundreds of installations at aviation-specific organizations worldwide. From airlines to heli-ops, law enforcement agencies, oil industry suppliers, MROs, CAMOs, medical evacuation response teams and more, businesses using WinAir regard the solution as a necessary component to the successful management of their fleet maintenance programs.